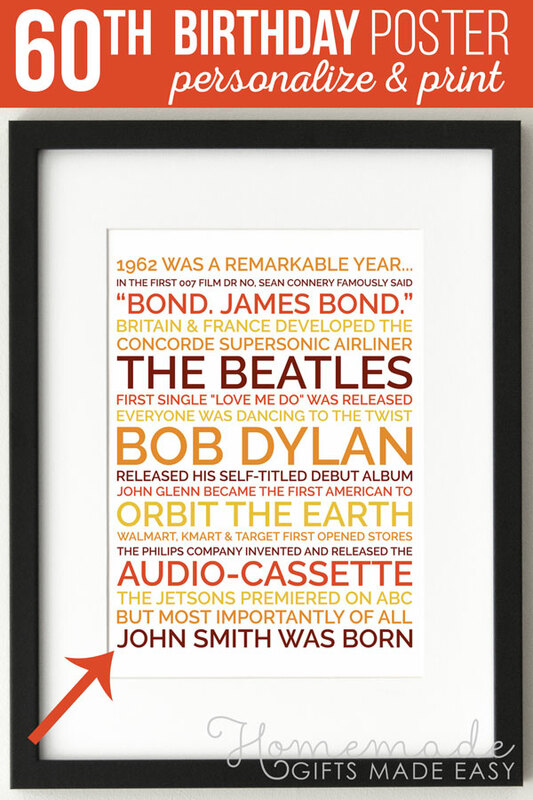 So, you're looking for a personalized 60th birthday gift. You want something unique, memorable, and creative, thoughtful, and one of a kind. But most of all you want something that they'll really love. 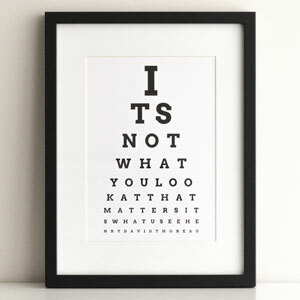 Here's what your poster will look like once you've framed it. This color palette in warm shades is a nice choice when making a 60th birthday gift for a man. And I love this colorful palette. 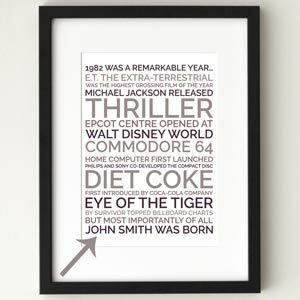 Ready to make a 60th birthday gag gift poster for your mom, dad or friend? 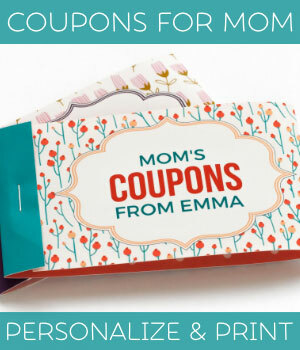 Want to create a present that's funny, memorable, and personalized? Let's do it! 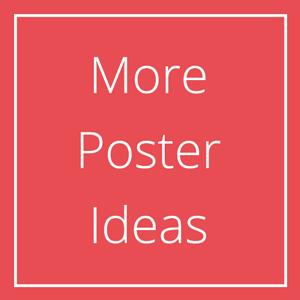 Click here for more poster wording ideas. I have no idea what to write in my poster. Can you help? Sure - check out my poster examples for inspiration. 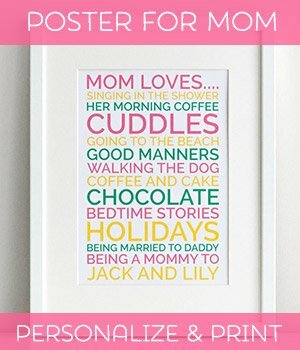 How do I print and frame my poster so that it looks as nice as in your photos? Is my printer good enough? Almost certainly. The trick is to use good quality paper. 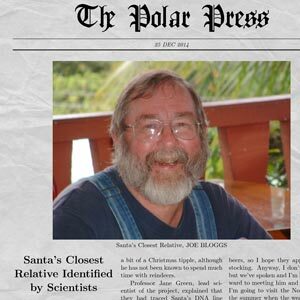 See my printing tips. What are the print size options? 8 × 10 inches is a popular size for photo prints, so it's a good choice if you want to print your poster at a photo print shop. Also it's usually easy to find 8 x 10" photo frames. 8.5 × 11 is a common printer paper size in the USA, so it's a good choice if you live in the USA and you want to print your poster at home. A4 is 210 × 297 millimeters or 8.27 × 11.69 inches. It's a popular printer paper size in most countries other than the USA. After you purchase you can download your poster in all 3 sizes for no extra cost. Can I print a different size other than the ones you offer? Sure! Take your downloaded file to a print shop and they'll be able to print it in whatever size you ask them to. Our "love it" guarantee: If the recipient doesn't LOVE their poster, email me and I'll refund every penny immediately, no questions asked, no matter how long it was since you purchased. Why should I pay for this when I could just make it myself? If you've got the skills, go for it! Just don't underestimate how many hours it will take (hint: probably 2 hrs, and even then it might not look quite right). Just to give you an idea: when I created this poster-maker it took me 2 hours just to find the perfect font, and then about 1hr to create each of the color palettes. But then again maybe I'm just a perfectionist. 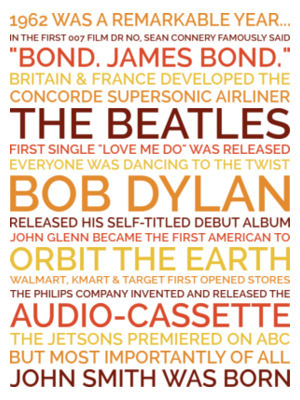 Here's an example poster wording that you can use as a starting point for writing your own message. It's already pre-filled into the poster maker. I've repeated it here just so that you can read it more clearly. Want even more facts? Check out 1959 on The People History and 1959 on Wikipedia. I recommend using matte photo paper. The vibrancy of the colors and crispness of text you get when using photo paper are leagues ahead of what you get using regular office paper. Ideally you should use the same brand of photo paper as your printer, or else stick to a well-known brand like Canon, HP, or Epson. 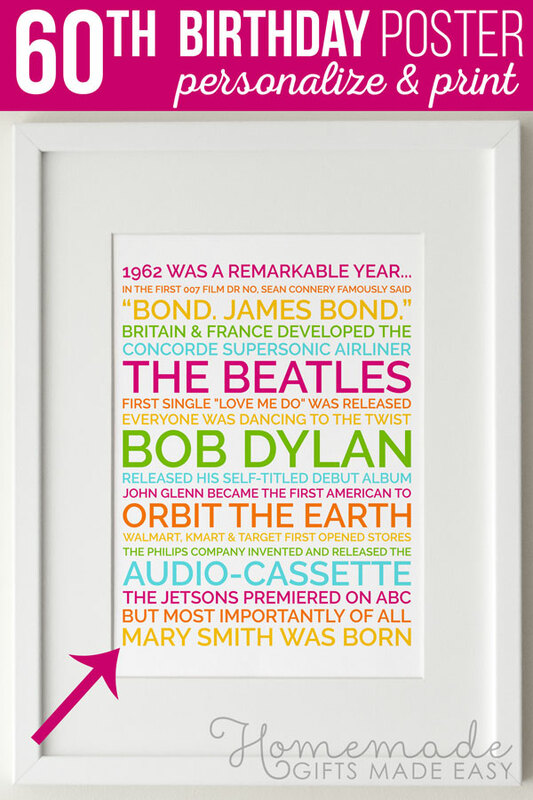 If you're giving an unframed print as a gift, then it's important for the paper to feel thick and high quality. It's worth getting the best quality matte paper that you can afford, like "Canon Luster Photo Paper" or "Canon Semi Gloss". If you're giving a framed print as a gift, then the thickness of the paper is less important so long as the colors are vibrant. 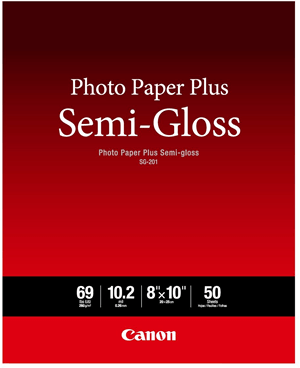 In that case a thinner photo paper like "Canon Matte Photo Paper" would be a good option - that's the paper I personally use most of the time. Can I just print it at Kinkos instead? Yes! That's a good option too, and many of our customer choose to do this. 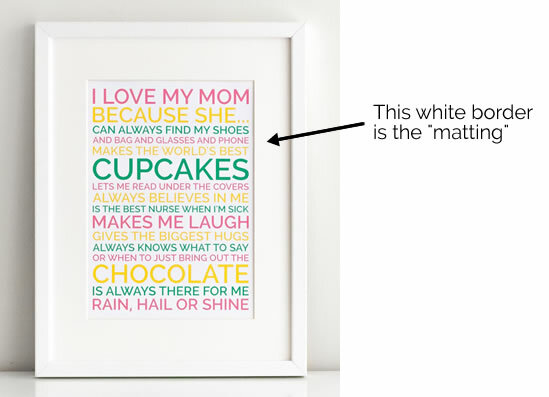 Personally I like "matted" frames, which are are ones that have a white border around the poster. I think they look great, and they also make your gift feel bigger and more substantial. If you ever visit an high-end photography gallery you'll notice that this is the type of frame that they use, simply because they look fantastic. In the UK, the best place I've found to get frames is Hobbycraft. You can get a 30 x 40 cm frame (to hold an A4 poster) for about £10.